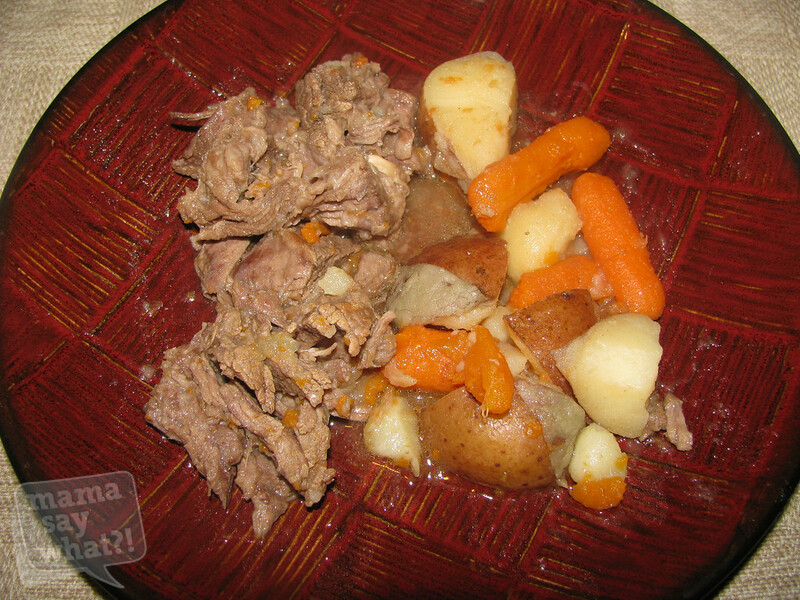 Quick and Easy Pot Roast Recipe | Mama Say What?! And I’ll admit, I enjoy restaurant food. It’s convenient and delicious, but it can get pricey. So I do try to cook when I can and when I look for recipes, I look for simple ingredients (nothing I’m going to have to Google) and simplicity in execution. 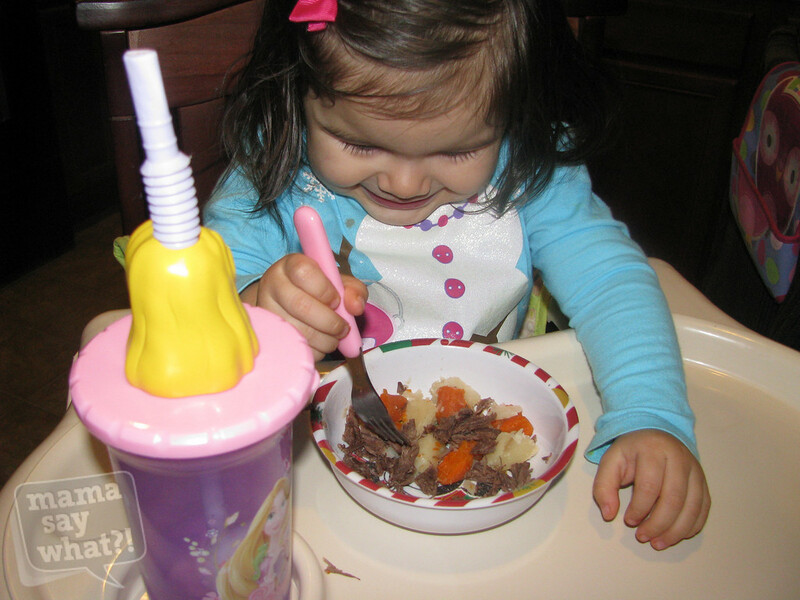 You can’t really get any easier than pot roast! It’s a crowd-pleaser, comforting and yummy. 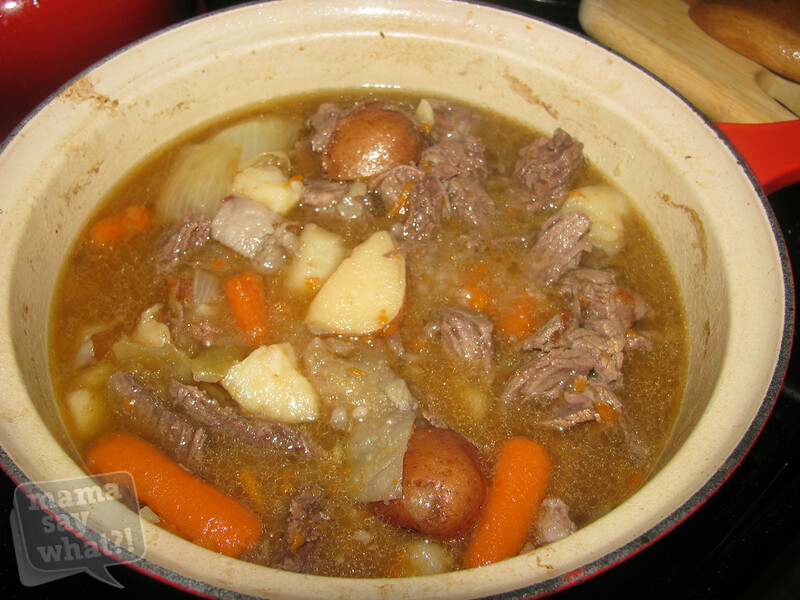 This recipe is an adaptation from Ree Drummond’s pot roast. She doesn’t add potatoes to hers because she thinks they come out “mealy.” I disagree, so I add them to mine. She also adds fresh herbs and I use dried. Fresh herbs can get expensive and it’s not like you can buy only 2 tbs when you’re grocery shopping; you have to buy a larger quantity and then are stuck with the pricey excess. Heat the olive oil in a dutch or french oven if you have one (I just have a large cast iron enameled pot). It must be oven-proof, since most of the cooking will be in the oven. While the oil is heating up, take out the meat and salt it generously with kosher salt. Once the oil is hot, brown the onion quarters. Remove and set aside, then brown the carrots. Remove those once they’re done and brown your meat. Bonus points if you also brown the sides, but you don’t have to. Remove that once browned as well. (I put everything in a large bowl until it’s time to put it back in). Pour in a little of the beef broth or red wine and deglaze the bottom of the pan (rub the bottom of the pan with a sturdy wooden spoon to scrape up all the brown spots). Then put the meat back in, then the onions and carrots (I like to push these into the open spots around the meat) then put the potatoes on top. Put a lid on it and stick in oven for about an hour per pound. Take out, serve and savor. My favorite parts of this recipe are that my family loves it, it takes minimal effort and creates minimal mess. All are huge deals to me. I have a hard to please husband and a picky toddler, but they both eat this right up! Added by Guest Mama on March 15, 2013. The recipe says 1 hour per pound. So the time will vary depending on how big your pot roast is. Thanks!